Half the bus was in the ditch, and the other was up in the air. Lucky for is, it was the rear that was in the ditch. All around me, people were crying and talking, and I was just sitting there, clutching the seat in front of me, thinking about what just happened. Somehow, the door was able to open, and one by one, people are able to go out with help from people on the ground. I was the last to go out, since I was at the last row of passengers that night. As I walked to the front, I saw that one section of the front left of the bus has caved in, while in the opposite corner, the windshield has cracked. The door was about 6 feet off the ground. Everything was being quickly organized to get the flow of traffic moving again, so we were ushered to the side of the road, 100 meters away from the bus. They were soon able to let cars and buses pass. During one of a break in the flow of traffic, I see a sole butterfly, flitting around the road. Was that because of a death in the scene or something that’s watching over us? Once they were able to extricate our bags from the bus’ cargo hold, we were carted off to a passing bus from the same company that’s also bound to KL. It was less than 50 minutes since the accident, and we were already moving again. Like our bus, they were hardly full, so there were spaces for us inside. Within 10 minutes of driving in the new bus, we came upon a small town. No wonder the response from the emergency unit was pretty fast. We soon came upon the rest stop. Most line up for the toilets, while the others head to the food stalls. I mean to eat during the stop over, but my tummy seemed to be filled with butterflies, that I can’t think about even trying to eat something. I just had a bottle of water and headed back to the bus. I was thinking very deeply about what just happened, and how that same morning, I was beating myself up over things that I regretted. I must have looked to be thoroughly depressed because the guy across the aisle, who was from the same bus that was in the accident, reached over and offered me candy. After close to an hour in the rest stop, we were back on the high way to Kuala Lumpur. I slept fitfully, and everytime the driver speeds up or makes a wide turn, I stiffen up and sit up, clenching the foam in my seat. We arrived in KL at 5:24, less than half an hour late from the scheduled 5am arrival. Considering that the bus has been in an acciddent, arriving this early is pretty impressive. It was too early to be going anywhere. My hostel doesn’t open until 7am, so I took a seat inside the bus station and tried to get some sleep. I was able to get a couple of cat naps in, until I had to leave the station. I was planning on taking the taxi, but when I stepped out, I see the LRT and decided to walk to the station instead. The train system in Kuala Lumpur is prety extensive, so you can pretty much go anywhere by just taking the trains and LRT. The only problem is that as Wei warned me, each LRT segment requires different tickets, hence the need to buy tickets at each stop, if you’re changing trains. I buy a ticket for Masjid Jamek, where I go out of the station and walk to the back where the entrance to the Kelana Jaya line was. I had to line up again to buy tickets, and had to ride the one stop to Pasar Seni, where my hostel was. Luckily, the person occupying the room I’ll be using checked out fairly early. By 9am, I am in my room. It’s a pretty good size for a single, with no windows. However, since it’s fairly big, and is painted bright colors, it does not look like a cell. The bed is comfortable, there’s a small multilevel cabinet, a power plug, and an exhaust that turns on your “airconditioning.” Showers and toilets are down the hall, as well as coin operated washing machines. I catch up on e-mail and plurks, and finished an entry before heading out for lunch and to search for a shop in the Mid Valley Megamall. My Internet was spotty, so I was only able to read up to Abdullah Hukum, the LRT station nearest Mid Valley. I take the train and I was surprised to see that only two of us alighted the train, and the other person works at the station. It was soon clear why. Though the Mid Valley mall is viewable from the station, it wasn’t easily accessible. It seems I missed the part that says Mid Valley has its own train linee that would require a transfer to another line. Ooops. Nevertheless, I found a way to get to the mall, and found the shop that I was looking for: Delectable. Delectable is the baby of this Malaysian Blogger that I’ve been following since 2007. She has such a passion for cooking, baking and designing cakes that she’s decided to finally open up shop in the Garden Mall in the Mid Valley malls. The shop was as cute as it looked in the photos, and unfortunately, photographs are not allowed. I planned on staying out the whole after noon, heading to KLCC after Mid Valley, but the heat zapped out my energy, and the best that I could do was to hail a cab to take me back to the hostel. It was fairly close, and since the meter wasn’t used, it cost me RM100 RM10 for that ride. 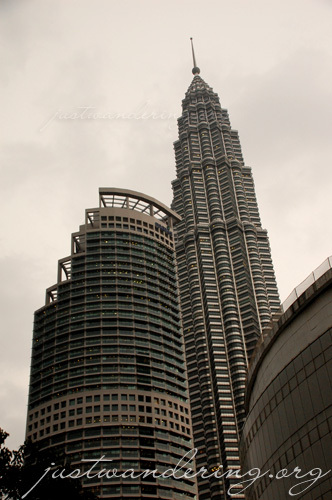 I rested in my room a bit, and headed out to KLCC for a shot of the Petronas Towers. It has started raining. Though this would usually stop me from ever going out, the Pasar Seni LRT was just too close to the hostel. 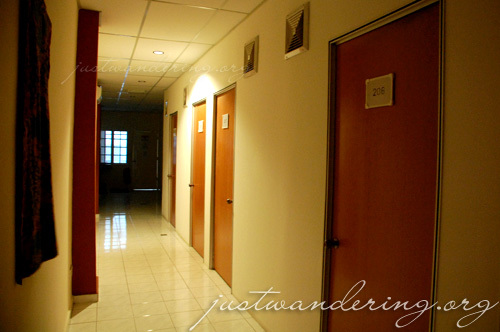 I emerge in Jalan Ampang, and walked over to the Corus Hotel, where I bougth tickets to Singapore. Yup, I’m cutting my trip short. Though my time in Malaysia is already awfully reduced, I’m starting to feel some travel fatigue. I wanted to go back to Penang, but I had to be practical, and Singapore is the practical choice for my next destination. Tickets in hand, I head back to the LRT station, where I crossed underground to the Suria KLCC mall, the mall right underneath the Petronas. 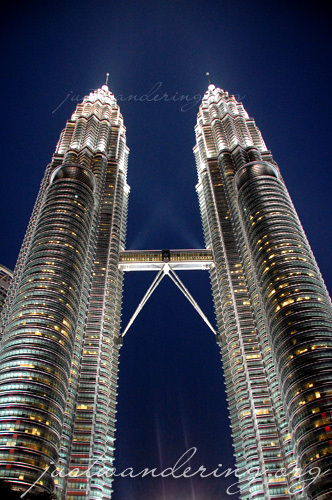 I wasn’t able to glimpse of the twin towers on my way to the hostel from the bus station, and just saw one tower from outside the Regency on Jalan Ampang. When seen from just underneath it while the building’s lights are lit, the tower is just amazing. I scope out the angles for Pinky shots, and took some night photos for posterity. RM100 for that taxi ride! OMG O.o I might as well change jobs and be a taxi driver. Really glad you’re safe, Nina.